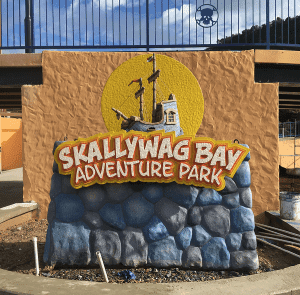 Skallywag Bay Adventure Park - Another Sawatzky Masterpiece! 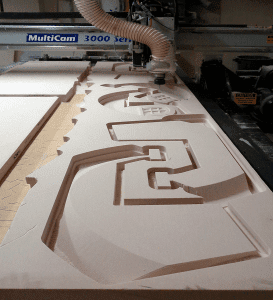 Coastal Enterprises, manufacturers of Precision Board HDU, is proud to announce a series of guest blogs written by Dan Sawatzky of Imagination Corporation, which will be posted on the Precision Board Blog each month. 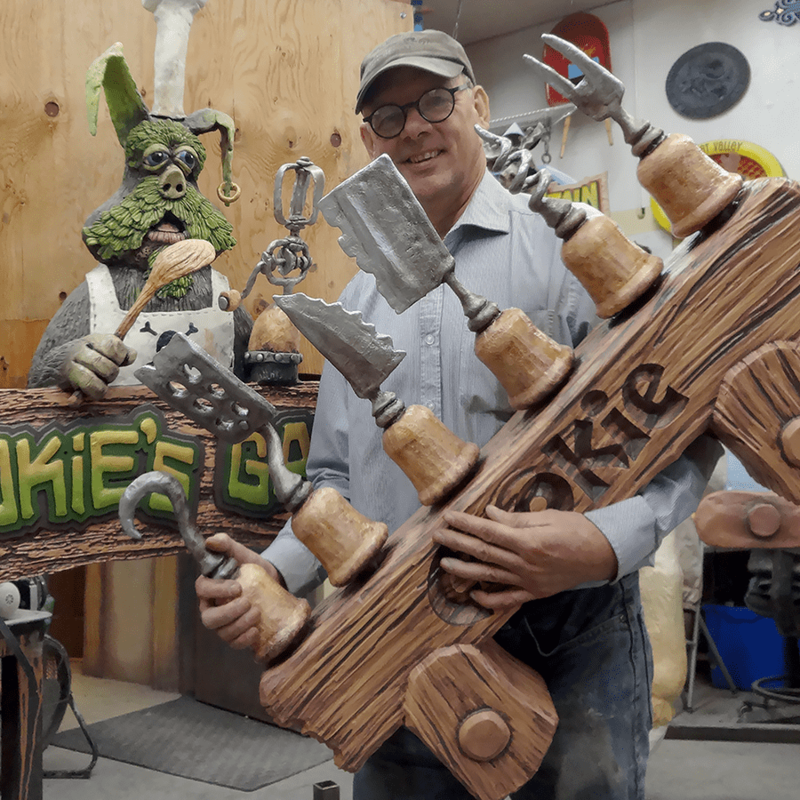 In this month’s entry, Dan Sawatzky tells us about the long journey from start to finish of the fantastical Skallywag Bay theme park, which his team built from top to bottom using a variety of materials, including PBLT-30 Precision Board HDU. We’ve been blessed with some amazing projects through the years. 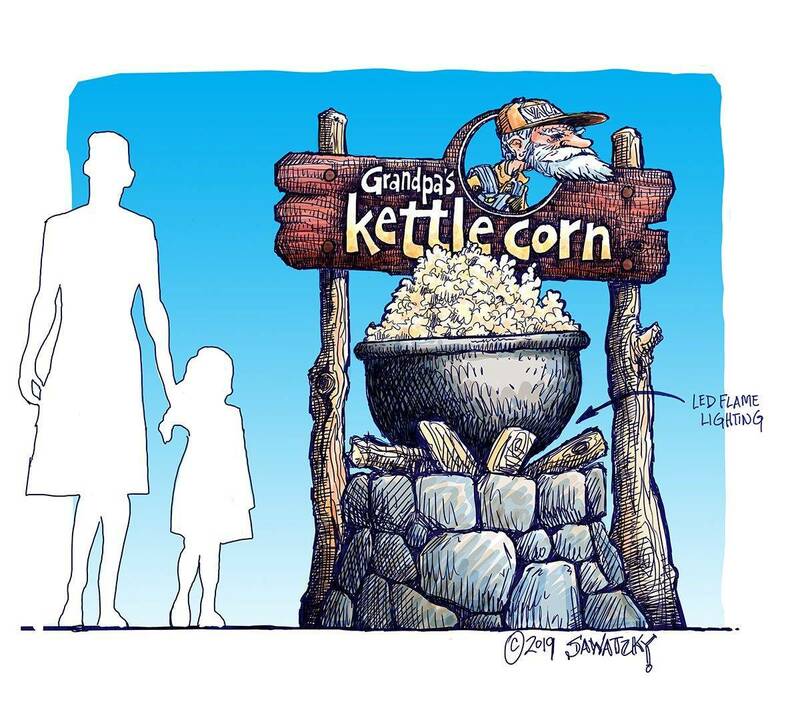 One of the most challenging and fun is now just wrapping up after five years of work. It actually began two years before that when a fellow from Trinidad came calling. 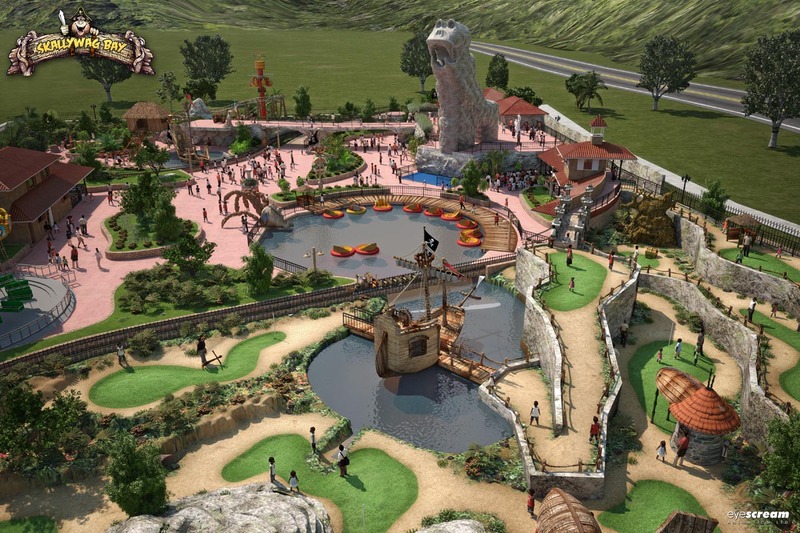 He had been searching for many years for someone to build him a theme park on the most southerly Caribbean island. He looked over our projects, toured our shop and declared us to be the builders. But things don’t move quickly in the Caribbean for it is a laid back and beautiful place. Imagine a place — a special place that isn’t anything like our world. It’s a place where imagination rules the day, where everyday concerns melt away and those who come here simply have fun with family and friends. This is a place where lifetime memories are created. 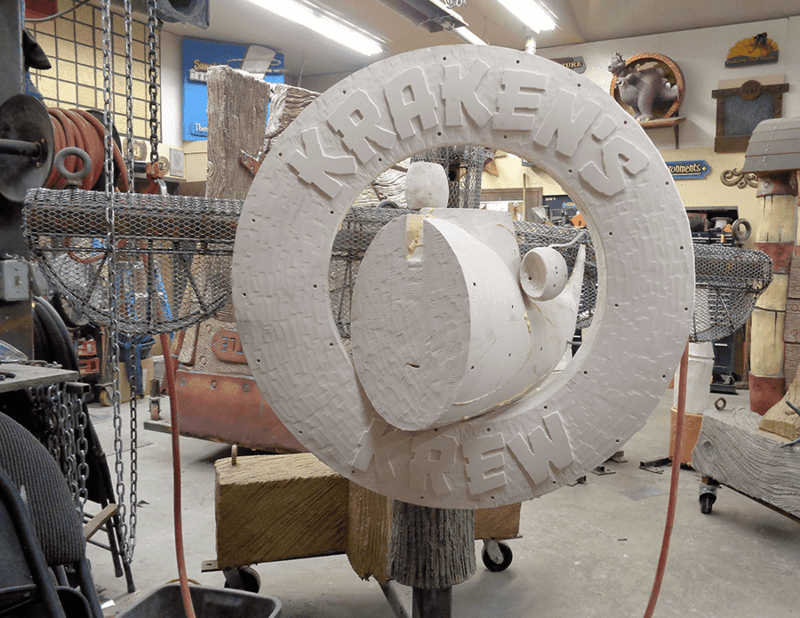 The legend of the Kraken was in fact founded on truth, but it was not based on a living beast as you may have heard. 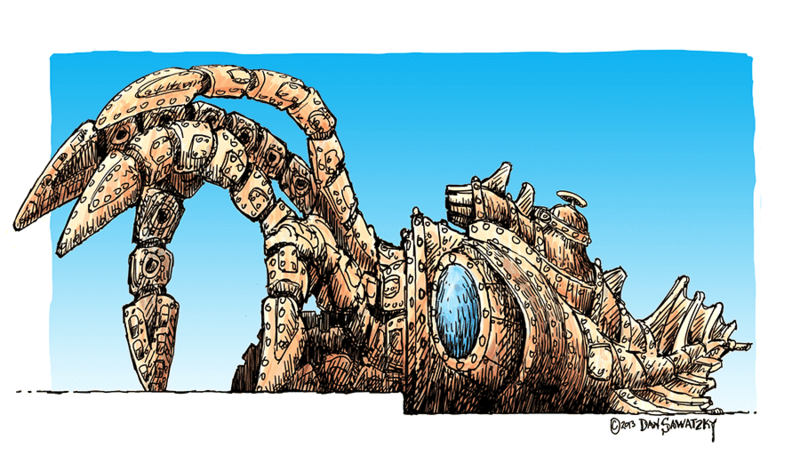 It’s origin is found in the Gruffle’s giant mechanical squid, crafted from forged metal and heavy wood timbers. The wooden pirate ships of old were no match for this fearsome, mechanical wonder. Few mariners survived to tell of this terror of the seas. These legends live on to this very day. Rumour has it that bountiful treasure is buried in these parts. This is the TRUE legend of Skallywag Bay. I made seventeen trips to Trinidad in all, most for a duration of three or four days, plus two travel days. It took about twenty-one hours of travel one way. There were also more than five thousand emails and countless phone calls and Skype conferences to get everything right, It was very fun but also extremely challenging! 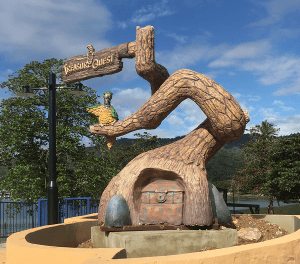 Since we were building all of our features and signs in our shop and I would be making only occasional trips to Trinidad, we needed detailed drawings for the local contractors to build all of the infrastructure for the park. There were many pages of formal drawings. We regularly communicated with Skype calls, emails and by phone. Hundreds of quick drawings were done on the fly to make sure everyone understood what was required. 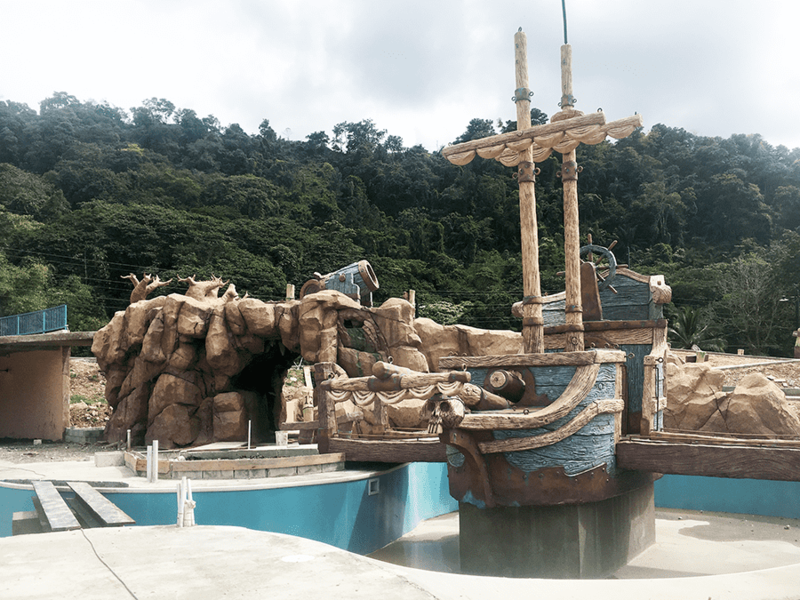 This was the very first theme park on the Caribbean island of Trinidad. The concept art I drew for the things we would build in our shop was much simpler and much fewer in number for this is what we do every day. 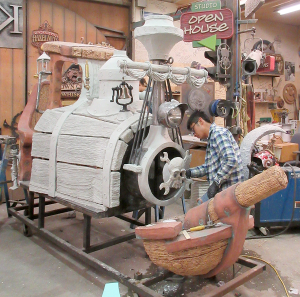 Many of the sign components for Skallywag Bay were routed from 30 lb Precision Board. We knew it would stand up to the harsh weather it would endure. Rather than our usual cold and ice we were concerned with heat, humidity and the salty sea blast. 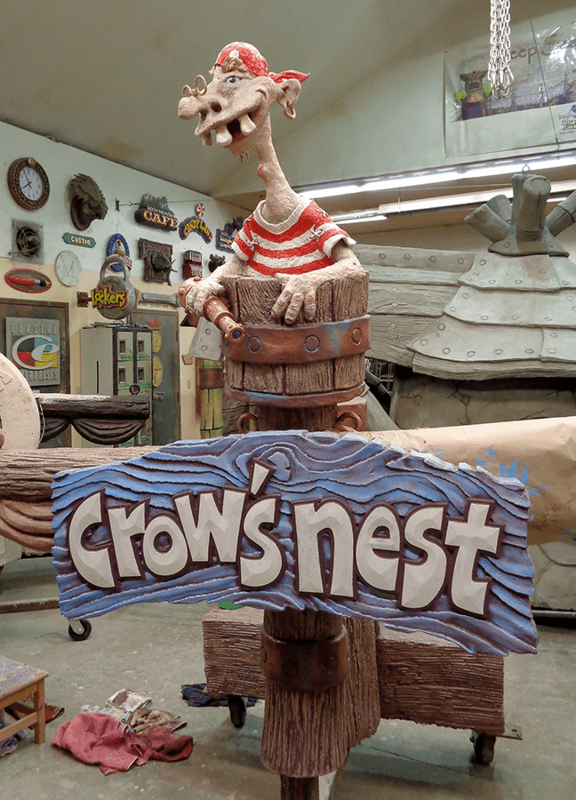 The sign details were hand sculpted using sculpting epoxy and then hand painted using acrylic paints. 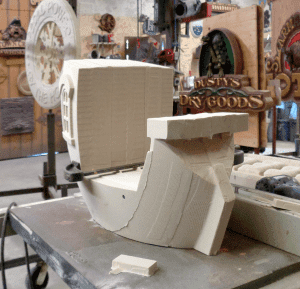 While we were building the signs with miniature replicas we were also building full size versions of the features for the park. They were built using fibreglass reinforced concrete over welded steel armatures. 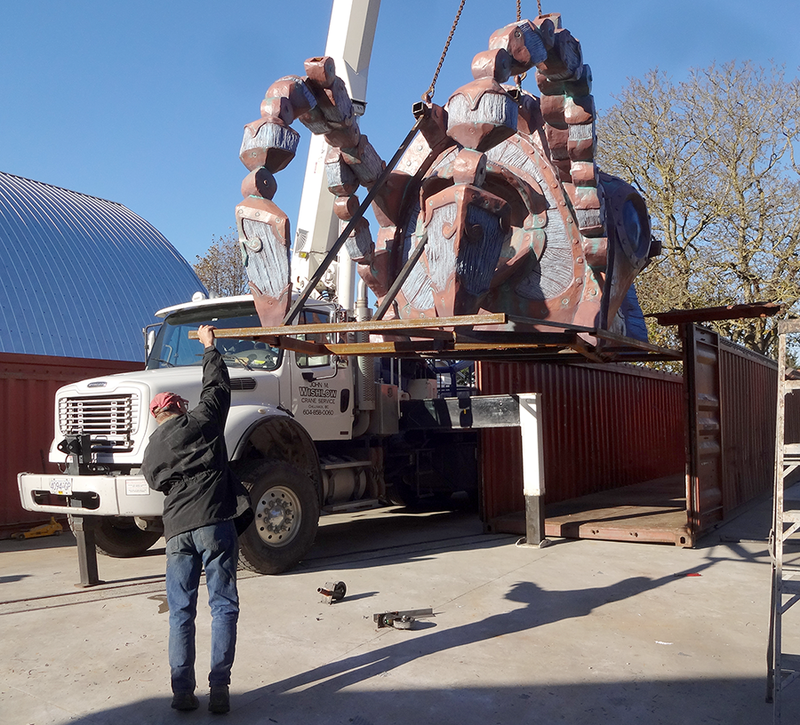 As we completed each piece we loaded them into shipping containers – eighteen in all. Each time we had three containers full we sent them on their way down the coast and through the Panama Canal to Trinidad. The trip took six – eight weeks. 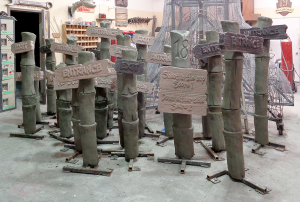 We went through plenty of 30 lb Precision Board on this project for there were more than a hundred signs in all. 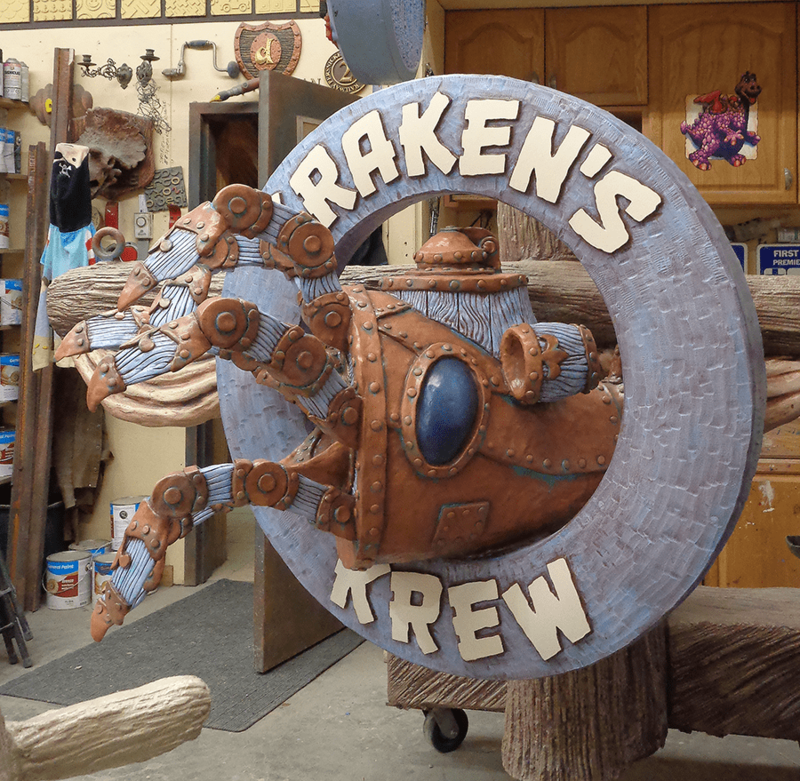 Some, like the small ships for the signs, were routed in layers and then laminated together. 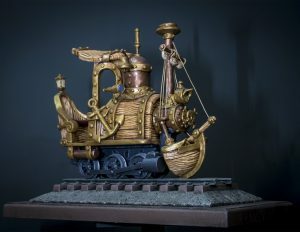 Like our bigger pieces, the small ships were carefully detailed by hand and then painted using acrylic paints and glazes. 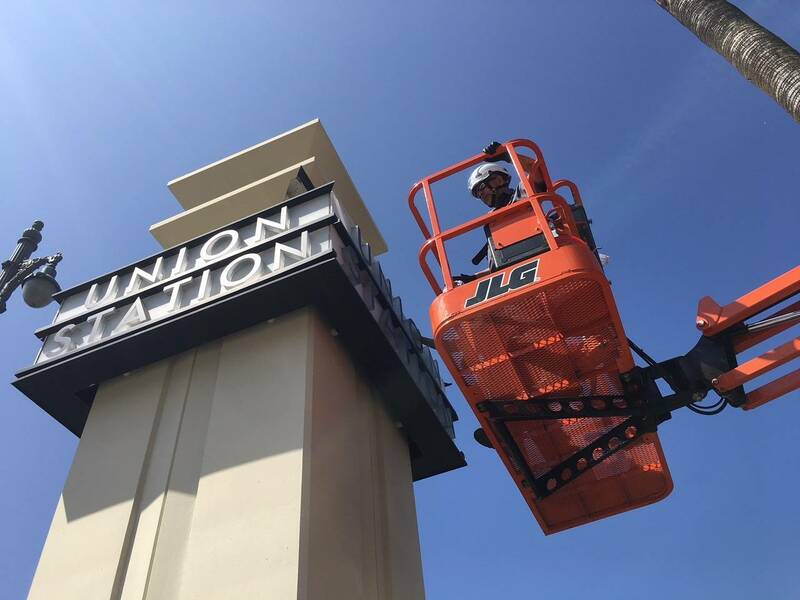 These signs were like many of the others and involved using a variety of materials including Precision Board and sculpted fibreglass reinforced concrete over a welded steel frame. 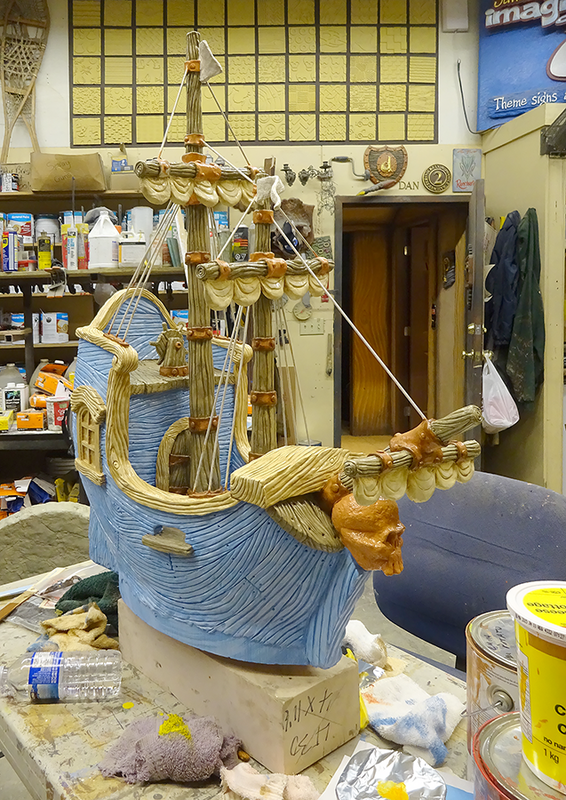 We also built a full-sized version of the sailing ship for the project. It ‘floats’ in the bumper boat pool and mini golfers play over it as part of the fun. The Skallywag Bay project was far too large for our team to do alone. We partnered with two rock work teams. One would do skull rock which was a climbing wall. The other team would do a variety of rock work through the park. To guide them we built a series of study models for them to use as a reference and guide. 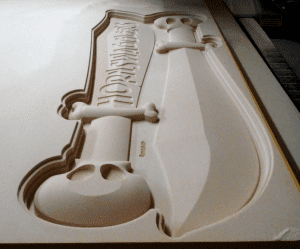 We used Precision Board HDU as a rough shape. 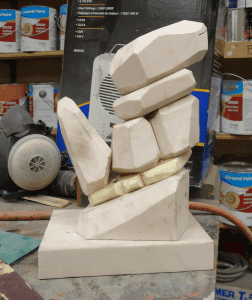 The final detail was put on with a thin layer of sculpting epoxy. 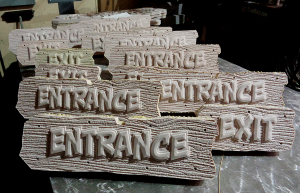 Each attraction got its own sign made from PBLT-30 Precision Board. 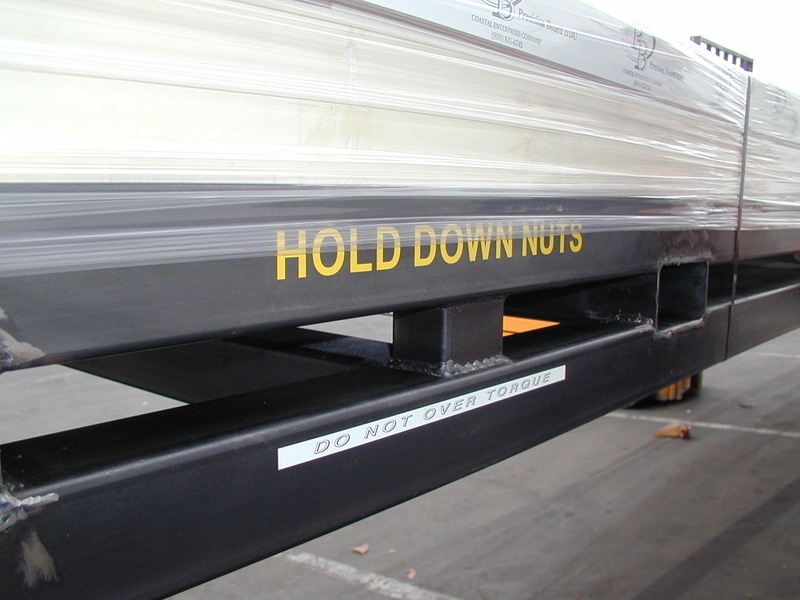 We made the signs with multiple layers of Precision Board and laminated a steel structure inside for durability. 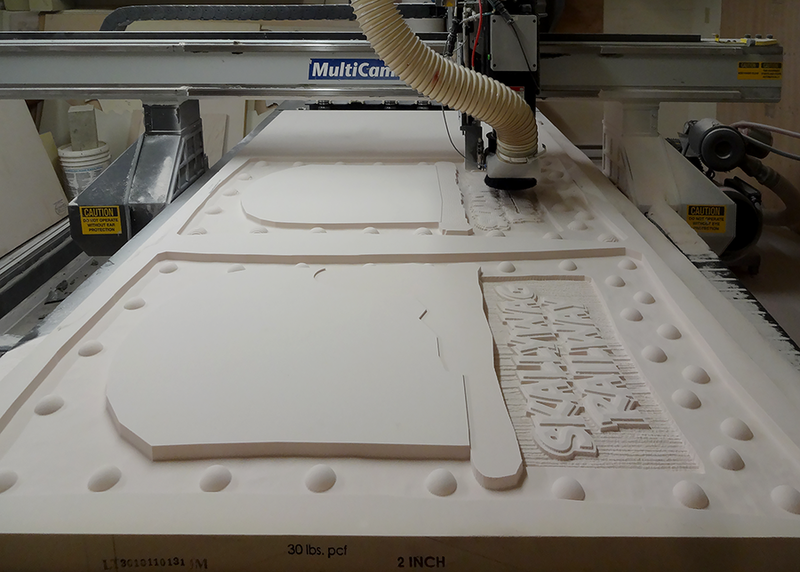 We routed the 30 lb Precision Board on our MultiCam and then laminated all of the pieces together. The fine detail was quicker and easier to sculpt by hand using sculpting epoxy. Each sign visually told the story of the truffles and Skallywag Bay. All with an over-the-top sense of humour, of course. This was a place to have fun after all! 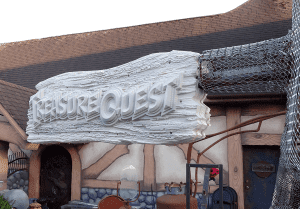 The Treasure Quest sign points the way to the kid’s play park. 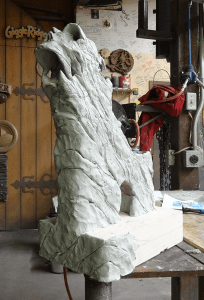 It is mounted to a tree which is sculpted from fibreglass reinforced concrete. This sign, like most, features a character who ‘lives’ in the park. The parrot’s name is Parlay. We certainly stretched the bounds of tongue in cheek humour with many ridiculous visual puns. 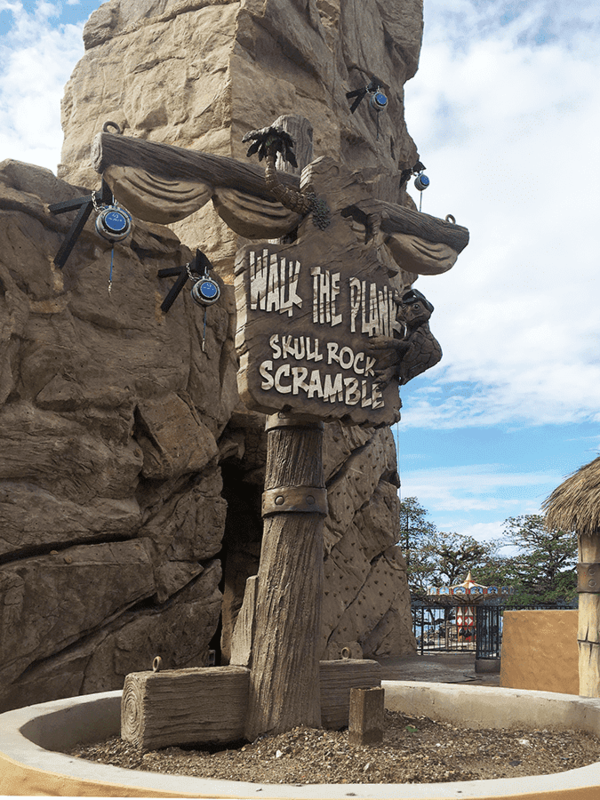 The keeper of Skull Rock, the climbing wall, is none other than Webster – a turtle like creature. He also happens to be great at climbing and is featured on the attraction sign. Our crew had a blast building and finishing the many signs. 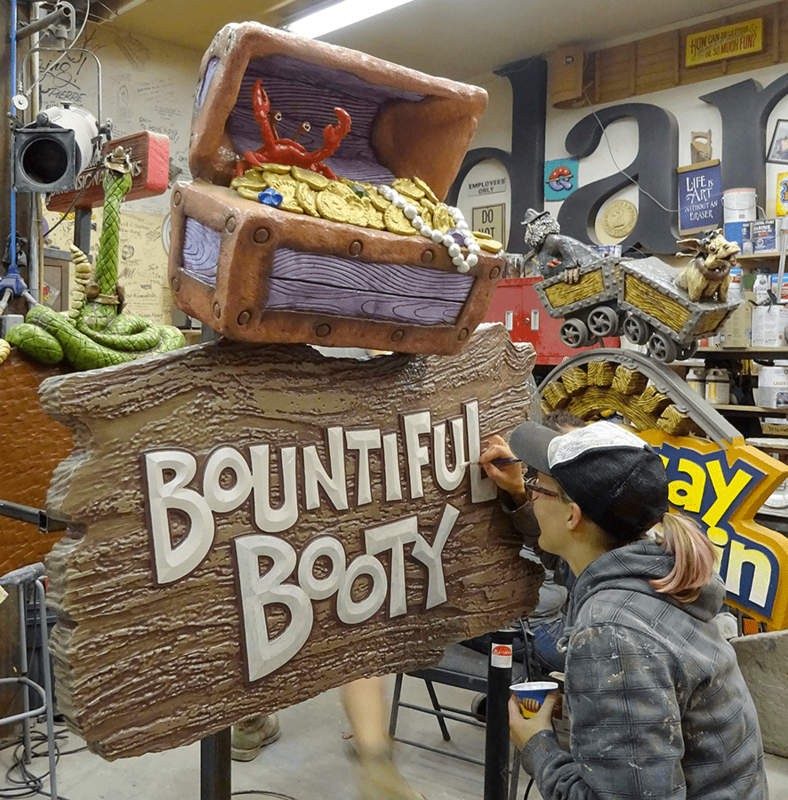 Here Angie is putting the finishing touches on the Bountiful Booty sign for the souvenir shop. There were scores of smaller signs as well. All were dimensional and finished on all sides. Once routed and laminated with some steel they were welded into a larger assembly and then the ‘bamboo’ fibreglass reinforced concrete post was sculpted. 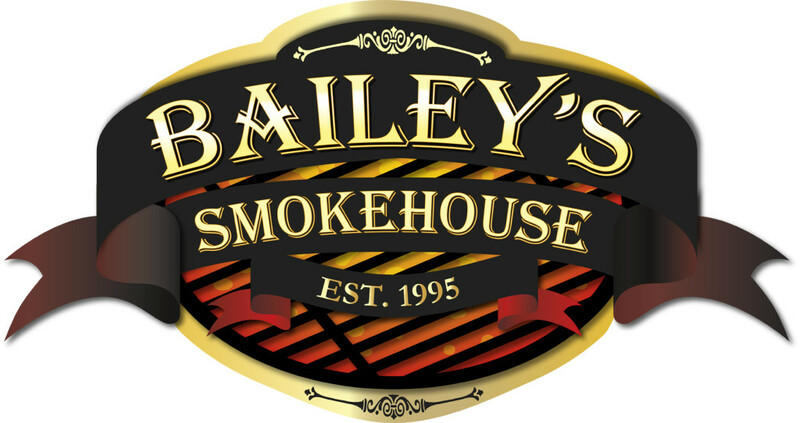 We partnered with other vendors from around the world for this project. Three of the rides were made in Italy. 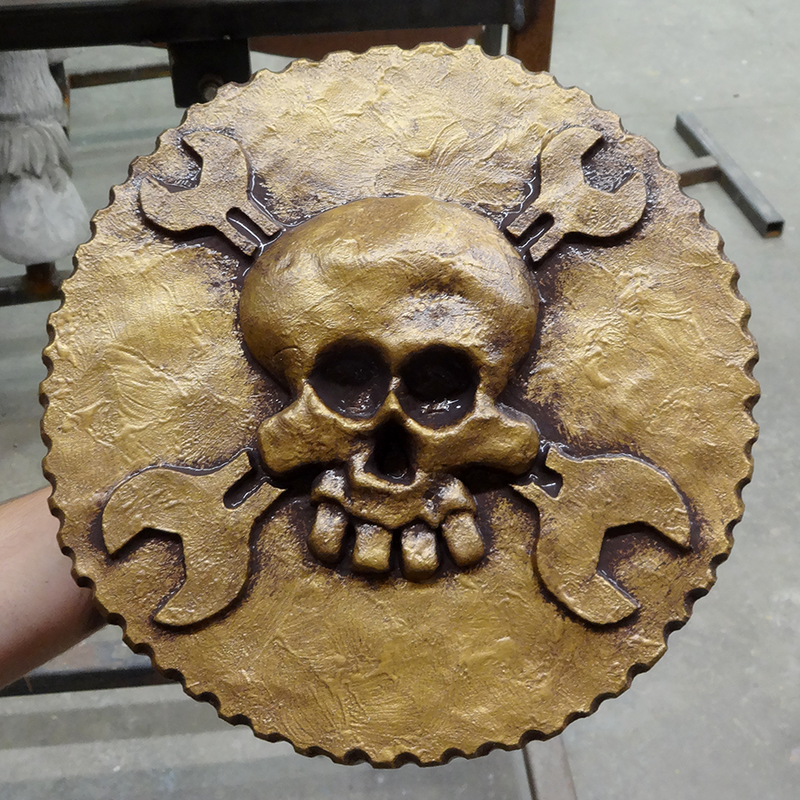 I did up the concept design for the car bodies and we also did a physical prototype of the medallion that would be fastened to the side of each vehicle. 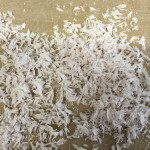 The ride manufacturer then pulled a mold off of our sample and made many more. 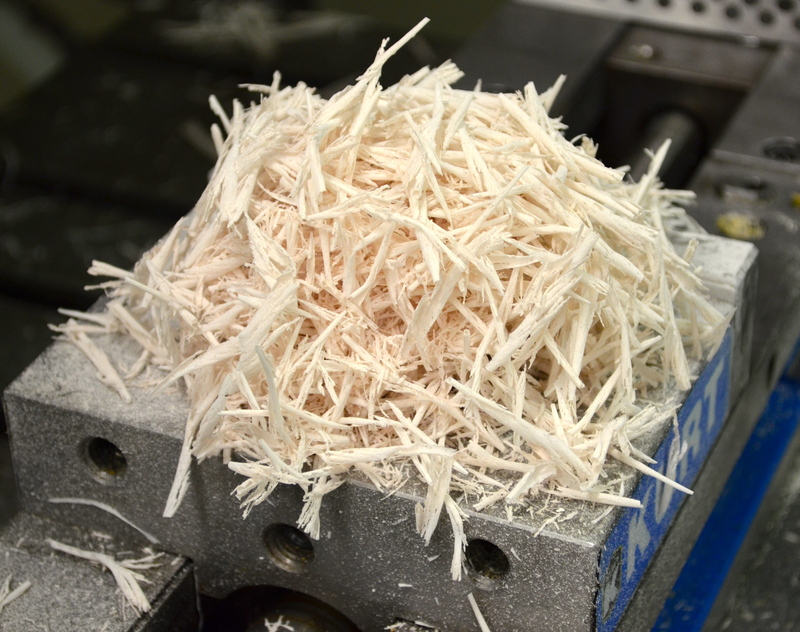 The prototype was routed from Precision Board, of course! One of the rides we did for the park was especially close to my heart, for I love trains. Pike is the mascot for this ride and his likeness is featured on the sign. Like most of the others, the sign is a combination of routed Precision Board, sculpted epoxy and hand sculpted fibreglass reinforced concrete. 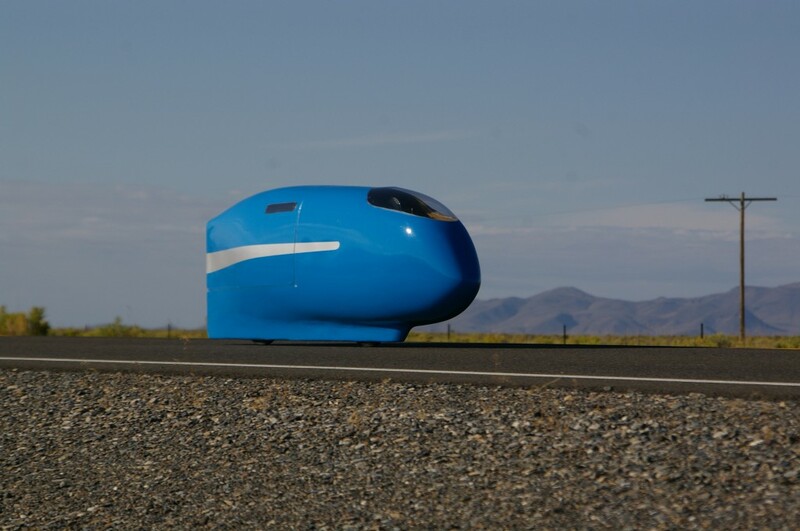 We built the body for the train in our shop while the fully powered and functioning chassis was fabricated in California by a renowned park train builder there. To guide their efforts and show how it would all fit together we constructed two detailed models. One we kept for our permanent display. The other we sent to California. 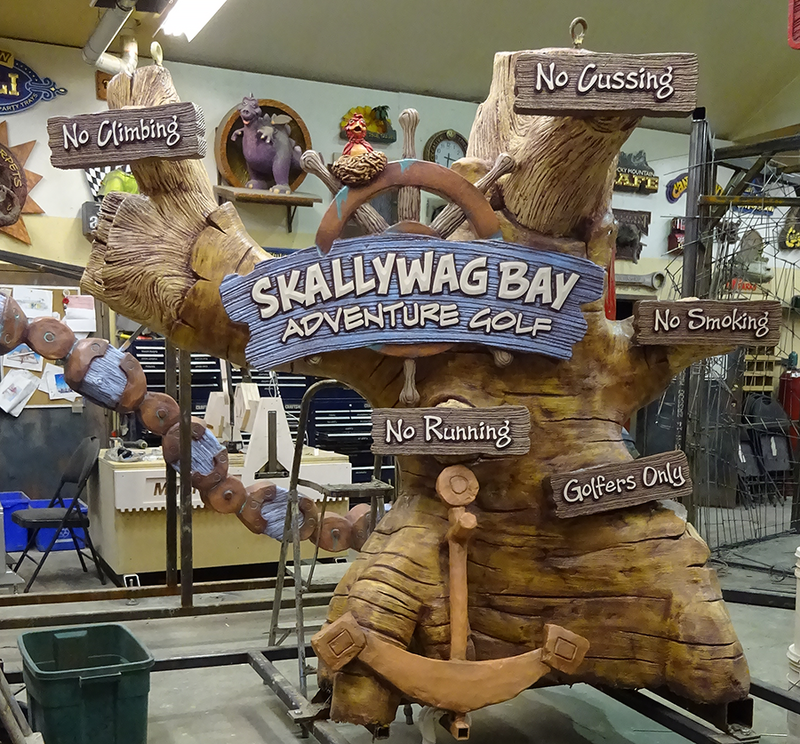 The Skallywag Bay Adventure Golf sign was one of the most complex and featured many components. All of the sign pieces were routed from Precision Board. 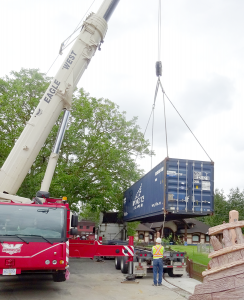 Each time we filled three containers we would call the trucks and bring in a giant crane. 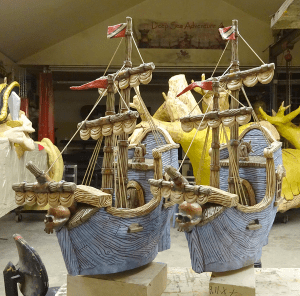 They would be lifted onto the trailer frames and then transported to the ports for the journey to Trinidad. 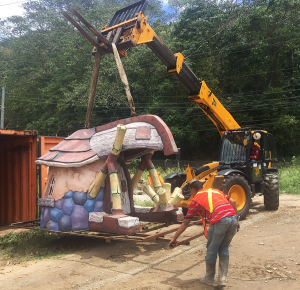 As construction in Trinidad took much longer than we were used to (island time) the eighteen containers full of our features and many others from the other vendors as well sat for more than a year before we opened them to start taking out the features and setting them in their permanent homes. Everything made the 7000 mile journey in perfect shape. Skallywag Bay is still not officially open… but I’m told it will happen soon… on island time, I’m sure.